Spektrum quality that is backed by Horizon Hobby and is as performance oriented as it is affordable. The STX2 radio system is a complete 2.4GHz 2Ch radio system that includes the waterproof SRX2 FHSS receiver. Need to replace your RTR radio system? Need to complete that kit with an affordable 2.4GHz radio system? If you answered yes to either of these, the Spektrum STX2 transmitter is the solution you've been looking for. The STX2 radio system offers many features of higher-end 2.4Ghz radio systems at a fraction of the price. Features like throttle/steering reversing, throttle/steering travel adjust & throttle limiting are all built into the STX2 transmitter. The radio system also includes the SRX200 2Ch waterproof receiver. -Complete 2.4GHz radio system including a 2Ch waterproof receiver Ideal for replacing RTR 2.4GHz radio systems or completing a kit that requires a radio system. 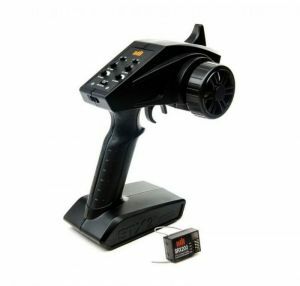 -Built-in 3-position throttle limiter Steering & throttle rate & trim adjustments with throttle and steering reversing. -FHSS 2.4GHz protocol* offers extended range and interference free performance. 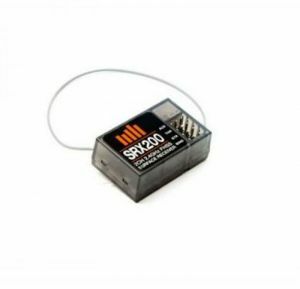 The STX2 and SRX200 utilize the FHSS 2.4GHz protocol and are NOT compatible with Spektrum DSM, DSM2 or DSMR transmitter or receivers. Works with only the Spektrum 210 rx.